Back in the early 1920’s, Vaudeville shows were the hot ticket. Saxophone virtuosos Rudy Weideoft and Adrian Rollini, along with famous saxophone ensembles such as the 6 Brown Brothers and the Schuester Sisters, were achieving great success and notoriety. The saxophone was the most well liked instrument and a popular choice for young, aspiring music students to play in school band. Then, in the late 20’s, Vaudeville, and, ultimately, the saxophone fell out of favor. With the decline in saxophone sales, manufacturers such as Conn, Buescher, King, and Selmer were forced to come up with creative new designs to stimulate renewed interest in the saxophone. What they conjured up was quite extraordinary. “Saxophobia” brings to the stage a rare and unique glimpse at some of the most unusual saxophones ever manufactured and the classic melodies that popularized this warmly embraced and versatile musical instrument. The show explores over a half century of jazz classics and recognizes the musical contributions of such artists as Stan Getz, Sidney Bechet, Charlie Parker, Paul Desmond, Gerry Mulligan, John Coltrane, Frankie Trambauer, Rudy Weideoft and others. Audiences will be introduced to over a dozen variations of Adolphe Sax’s 1846 invention including a curved sopranino, plastic alto, straight tenor, connosax, slide sax, bass and even a rare 6 ft contrabass sax. Some of the musical selections programmed in a typical “Saxophobia” show include “Autumn Leaves,” “All The Things You Are,” “Take 5,” “My Favorite Things,” “Singing The Blues,” “When You Wish Upon A Star,” “Stompin At The Savoy,” and “My Romance.” Throw in a little “My Three Sons,” “Tequila,” “Pink Panther,” and “Yakety Sax” just for fun and you’ve got an entertaining, rich and riveting history of the saxophone and the players who gave the sax its distinctive voice in jazz. Like baseball and apple pie, jazz is an American icon. Over the past century, the saxophone has played an important role in the development of this indigenous art form. Hear popular jazz standards and whimsical novelty selections, see an impressive array of rare instruments, and absorb a bit of saxophone history. “Saxophobia” brings to your concert stage an extraordinary educational, historical and entertaining presentation of the saxophone. 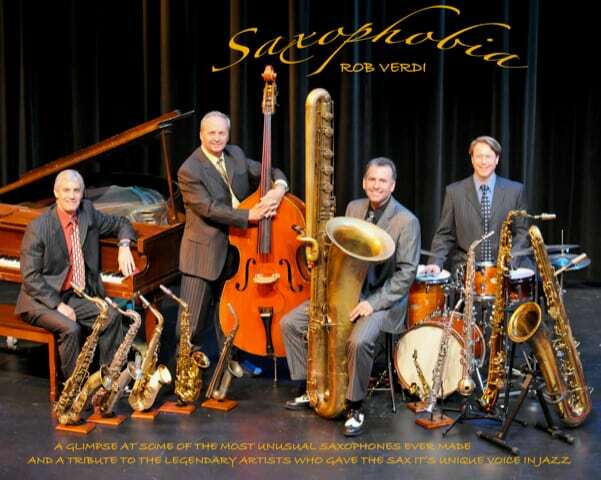 “Saxophobia” can be presented three ways; as a solo act, as a quartet accompanied by piano, bass and drums, or with Rob as a guest artist with your local high school or community concert band or jazz band. Please visit the “SAXATIONAL SCHOOL SHOW” tab to find out more information about this guest artist program.